Higurashi no Naku Koro Ni Kai 6: Give it Away, Give it Away, Give it Away Now! Gosh, did they have to make things that clear? 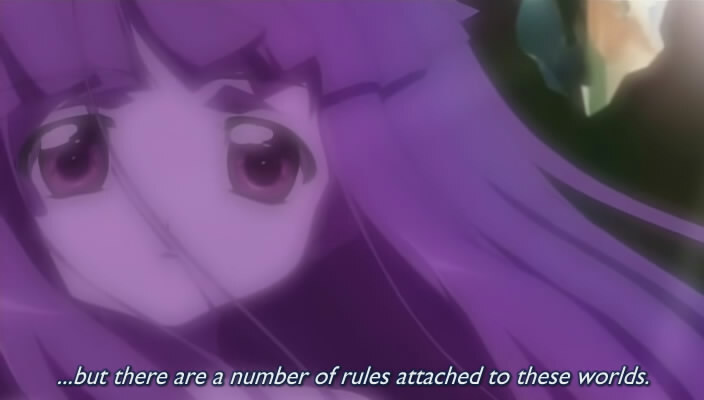 This episode, which begins a new arc, pretty much lays down the ground rules for what was happening in this Higurashi world, point by point. It also seems to represent a hinge of sorts, where the characters finally can begin to make real decisions and either, depending on the way the authors want to take it, go into redemption or even deeper tragedy. The most important change is in Rika–and, it turns out, her ghostly alter ego/personality, Hanyuu. Hanyuu, it seems, is the one with the high-pitched squeaky cutesy voice, and in the midst of a portentious set of dialogues, it’s her that gets the chibi treatment. I’d said in earlier articles that the constant fatalism of Rika was getting annoying after a while. Here, this episode and it looks like this arc takes that on directly: it brings up the question, can fate be altered? Do we live in a deterministic universe in which the same things are decreed to happen over and over again? Or can things, just maybe, change? The Powers that Be must be respected rather than conquered or dismissed. In the premodern and medieval world, powers and forces were often concentrated in concrete places or objects: think saints’ relics, or special shrines. One of the ways the modern world was “dis-enchanted” was when it lost the sense that the Numinous, the Holy and the Other, was tied to specific places. This show brings it back. Another one of the key aspects of the premodern pagan understanding (East and West) is its fatalism. Many of the Greek tragedies are about heroes fighting, and losing, against their set destinies, and it’s no accident that one of the more appealing and noble pagan philosophies in ancient Rome, Stoicism, counseled a serene resignation to the circumstances of the world. In Buddhist-inspired cultures, the cycle of reincarnation and karma meant that the way you turned out was in part the product of something that happened long before your present life. Keichii’s challenge to a small part of fate–the game they are scheduled to play–is enough to shake Rika out of her funk and restores her hope that things might be different this time. 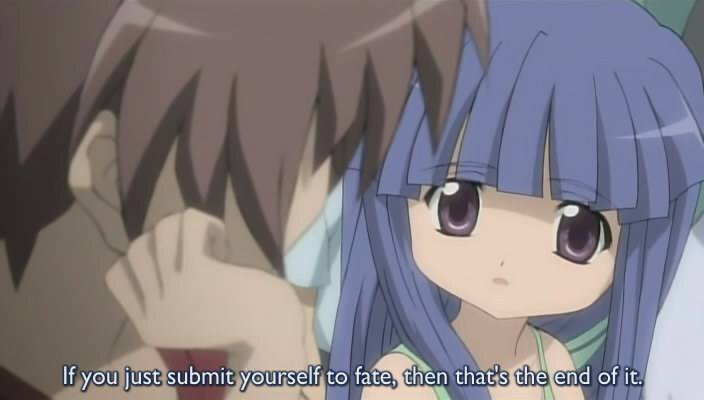 In Buddhism, the eventual goal is to escape the cycle of reincarnation into Nirvana, and since we’ve learned that the Higurashi world is one recycled situation after another (literally! ), the goal too of all the characters is to find a way so that the murders and paranoia cease at least. It might be through love and forgiveness, as hinted at the end of season 1. Or it might be through just a series of small steps that, when added up, get bigger and bigger until you arrive at a different ending. Or, alternatively, the story could end tragically; the characters think they can escape their destiny, but in the end it finds them anyway. That would be a depressing, but traditional and classical, way to end this. This continues to be one of the most fascinating animes made in recent times and I look forward to watching more. Previous PostWe’re giving away a prize to our 500th commenter!Next PostClaymore 20 – There never was much hope. Just a fool’s hope. Hanyuu is a hueg spoiler. And a cigar is sometimes only a cigar. Sorry. I thought the title was clue enough that this would probably contain spoilers. I’ve added an additional warning. Damn those Anime gals are so cute.